Well day 2 is working its way through with a few more hours left I’m not sure what I’ll do tonight. I went to improvOlympic last night and caught a fun show but they aren’t showing anything which really appeals to me tonight so I think I may hang out around the hostel tonight or within a few blocks of it. Tomorrow I plan to hit the Museum of Science and Industry as well as probably go over to iO for shows that night. The museum is a fair trek for me so I’ll probably be busing it or taking one of the trains, I haven’t figured it out yet. 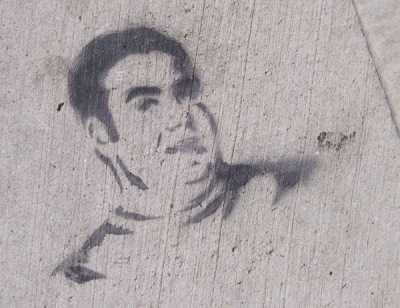 I’m not quite sure who he is, but he’s good enough to be stenciled on the sidewalk which means he’s good enough to get photographed. I think he looks a little like Fat Albert. Whoever he is, I wish him luck on his campaign.